MASSIVE NEWS jam music fans! After one year of absence, The Dave Matthews Band is back on tour in 2018, and they’ve confirmed a new album, their ninth so far due for release this year! They’re on their way to the Budweiser Stage on Tuesday 10th July 2018 – be there! Hit the “Buy Tickets,” button above to get yours today. Formed in Virginia in 1991, with a shifting lineup centered around core member and principal songwriter Dave Matthews, the Dave Matthews Band have gone on to become one of the most successful rock bands in the world. The first band ever to have six consecutive albums hit the top spot on the Billboard 200, the band have globally sold in excess of 50 million records!! Known for their extensive touring schedule across Europe as well as North America, the band pays homage to traditional jam band custom with their extensive live improvisations in combination with a unique sound, lighting and stage design. They never play any song the same way twice, making every Dave Matthews Band a truly one-of-a-kinda experience! It’s no wonder people who’ve seen them before make a point of attending shows by the Dave Matthews Band over and over again. If you’re ready for another one, be quick about getting tickets – and if you’ve never seen them before, you’re in for a treat! 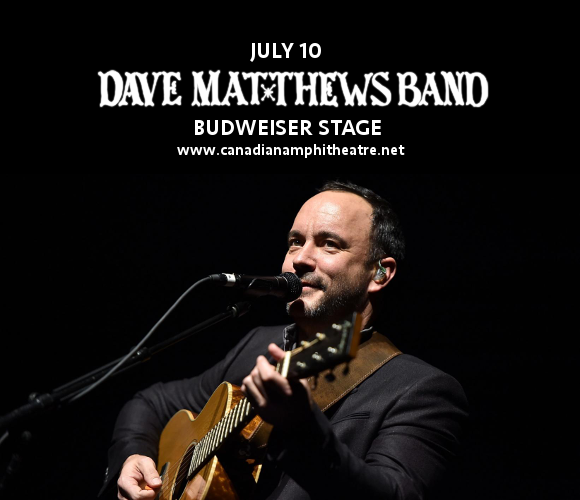 Get your tickets for the Dave Matthews Band NOW while they last! !